I don’t really know anyone who doesn’t love flavorful salsas to enhance the food they eat. These restaurant salsas add zest to food and make your food very special! They are favorite additions for a variety of foods. The Mexican word for "sauce," salsa may be made with a variety of ingredients and may be fresh (raw) or cooked. Adjusting the "heat" is a matter of the specific peppers used (if any) in a salsa. And do not use the seeds in the peppers unless you like "hotter" salsa. Salsa roja (red sauce) is used as a condiment in Mexican and southwestern U.S. cuisine, and usually made with cooked tomatoes, chili peppers, onion, garlic, and fresh cilantro. 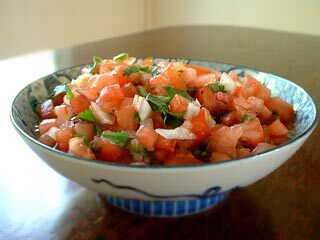 Salsa cruda (raw sauce) is also known as pico de gallo or salsa fresca. It is made with raw tomatoes, lime juice, chili peppers, onions, cilantro leaves, and other coarsely chopped raw ingredients. Salsa verde (green sauce) is made with tomatillos. Sauces made with tomatillos are usually cooked. Salsa taquera (Taco sauce) is made with tomatillos and morita chilies. Salsa ranchera (ranch-style sauce) is made with tomatoes, various chilies, and spices. Salsa brava (wild sauce) is usually made of a mayonnaise-Tabasco mix. Guacamole is usually any sauce where the main ingredient is avocado. Today the variety of salsas is endless. 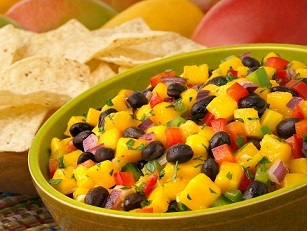 You can use an array of fresh fruits and vegetables to make a variety of salsas. Some recipes result in ones that are fruity, some hot, some smoky, and some sweet and spicy. 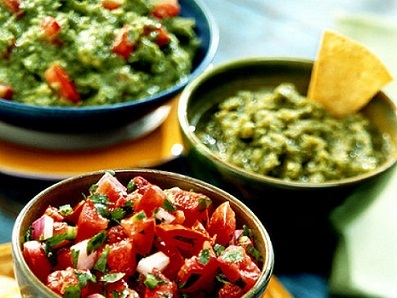 Serve these restaurant style salsas with tortilla chips, quesadillas, tacos, grilled meats, chicken, seafood, and eggs. I also use these restaurant recipes in soups and sauces and as a base for other dips. Homemade or restaurant-made quality salsas are hearty and flavorful and they're healthy too, with little or no fat and no preservatives. And fortunately, they're also easy to make. Blenders and food processors significantly cut down on preparation times. The other difference between the homemade and some store-bought salsa is shelf-life. Care should be taken in the preparation and storage of salsa because without preservatives, many raw-served varieties can lead to the growth of potentially dangerous bacteria, especially when unrefrigerated. Making homemade salsa is easy with this black bean salsa with tomato. You can be enjoying a delicious homemade salsa in minutes. Preparation time: 15 minutes. Serves 6-8. A fresh salsa made from chopped tomato, onion, and chilies -usually serranos or jalapeños and usually fresh cilantro. Preparation time: 15 minutes. Makes 2 cups. A delicious restaurant salsa recipe to use with your favorite corn chips or nachos! Serve it on-the-side with chicken or a ground chuck patty topped with Cheddar cheese, a side of guacamole and a side of sour cream. Preparation time: 30 minutes. Servings: 3-4 cups depending on the size of the tomatoes. This salsa is brightly colored and fresh. It is fantastic over broiled salmon or scrambled eggs, with fried chicken, pan fried pork chops, and pan fried potatoes, eggs and white fish. Serve the salsa with tacos or burritos or as a dip with tortilla chips. Preparation time: 25-30 minutes. Makes about 2 cups. This restaurant salsa recipe goes great with most fish, shrimp, chicken and pork chops. Preparation time: 20 minutes. Makes about 5-6 cups. Guacamole has become so popular in most parts of the United States, that people enjoy the dip all year long, not just for celebrating Cinco de Mayo. Preparation time: 15-20 minutes. Makes about 1 1/2 cups. 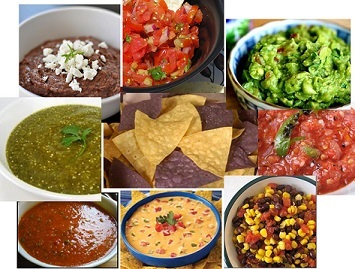 Thanks for your interest in restaurant style salsa recipes. With these restaurant recipes, you can cook with confidence and style. "I wish my PMS would manifest itself in a desire to clean rather than a desire to invent foods to put salsa on."